Maximum brightness, all LED warning light w/ 5 user-selectable flash patterns. Features aluminum heat-sink that extends the life of the LED through improved heat dispersion. 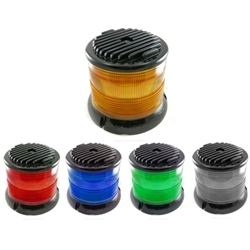 Can replace any existing warning light and increase visibility, decrease current draw, and eliminate maintenance. This product is made to order. Please allow 7 to 10 business days for factory assembly.